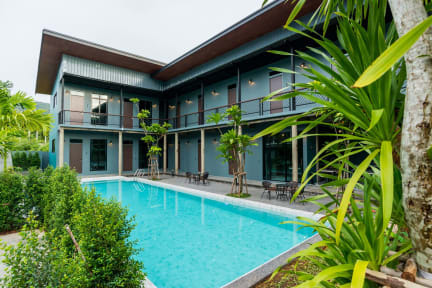 Very modern, clean and tidy hostel, lovely pool. Good group of people mingling in the common areas on the evening. All jumped in a taxi together and went out to Ao Nang town! 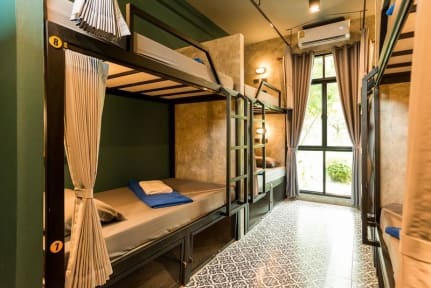 Wish all hostels were the same as this. Lovely hostel- brand new, and pristinely clean! The rooms have curtains around the bed for some privacy and each have a double plug socket, a light and a little shelf. There’s free tea, coffee, biscuits and drinking water 24/7! You can also order simple breakfasts, sandwiches, noodle pots and crisps from the reception or there is a great restaurant next door! The pool is beautiful, however doesn’t get the sun all day! The only down side is the location isn’t the best! However you can hire peds! This hostel was great, the beds were cosy and private and the showers were good! There was a lot of chill areas and the pool was lovely. The only downside was the location, it wasn’t 15 mins from the beach it was about a 15 min taxi ride which cost us around 200 baht every time which was annoying, overall a good stay though! Loved everything about this hostel, only stayed one night because of the distance from the beach. Staff was nice, rooms were clean and quiet, breakfast was amazing the day I checked out and the woman at reception helped me figure out how to get to my next hostel. If you are looking for somewhere quiet to relax this is the perfect place. The beds are a little hard as expected from most hostels. The bathrooms are nice amd clean. If you plan ro go to the beach a lot you will need to rent a scooter since it is a long wall from the hostel. If you look at the map you should know that before staying here so stop complaining about it. Wpuld stay again if I am looking to relax and not party. Beautiful and Clean, really quiet if you wanna have a good rest. The bathroom is the best I have had during my trip. Only stayed here two nights but loved it! The room was clean and airconditioned. Bathrooms were gender neutral but very kept up with. Pool was nice and cold. Free coffee, tea, and water all day which was great! Staff could’ve been a little more helpful. Hard and expensive to get to other locations but the restaurant next door was lovely. No kind of atmosphere though; if you’re looking to meet new people this isn’t not the place. Would come again! Overall nice hostel, however the atmosphere is completely dead & the hostel is ages away from everything. Costs 200bhat just to get to the beach one way. The staff are very hard to communicate with and unhelpful. The pool NEVER has any sun on it!! Restaurant next door however is amazing!! Firstly when we got there it was a lot further out and remote than expected. Misleading as they said it was a 15 minute walk from the beach. It was a good 30/40 walk to Ao Nang so wouldn’t recommend if you want to be near this area as you’d have to get a taxi or bus. Very remote not many restaurants near by. We had two beds in a female dorm, both of which had ants in as soon as we arrived. Luckily they had spare beds in another dorm to be moved to but the staff weren’t very apologetic.